THE SUN AWAKENS, NASA IS WARY: The sun is waking up from a deep slumber, and the next few years could bring much higher levels of solar activity. NASA is keeping a wary eye on the sun as officials meet in Washington DC on June 8th to discuss the potential consequences of stormy space weather. Get the full story from Science@NASA. "I still can't believe that I caught a live impact on Jupiter," says Go, who has made a must-see video of the event. "There were no visible remains at the impact point for the next half hour or so, until sunrise put an end to the imaging," says Wesley. The nature of the impactor is presently unknown. It might have been an asteroid or a comet. In either case, a dark and cindery debris field is expected to develop around the impact point; that's what has happened in the aftermath of previous Jupiter impacts. 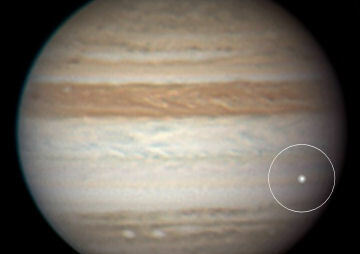 Astronomers are encouraged to monitor Jupiter, and stay tuned for updates. Update #2: Wesley has posted a 46 MB video of the impact on his web page. Update #1: Anthony Wesley has pinpointed the impact site at Jovian latitude minus 16.1o, and central meridian longitudes CM1: 300o, CM2: 33.8o and CM3: 210.4o. NOCTILUCENT CLOUDS: Every summer since the late 19th century, Earth's polar skies have lit up with gossamer, electric-blue clouds, twisting and rippling in the twilight sky. They're called noctilucent ("night-shining") because they can be seen after dark. The origin of the clouds, which hover at the very top of Earth's atmosphere in close proximity to space itself, is uncertain. They have been linked to causes as varied as meteoroids, climate change, and the icy exhaust of the space shuttle. "I made a 3-hour movie of the phenomenon," says Grønne. "There was a lot of activity." Lars Zielke of Tvis, Denmark, witnessed the same display. "They were visible due north near the horizon. The clouds were not spectacular compared to others I've seen, but it's a start." 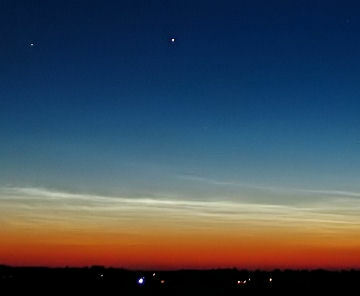 There is a well-known correlation between noctilucent clouds and the solar cycle. NLC activity tends to peak during (and just after) years of solar minimum, possibly because low solar activity allows the upper atmosphere to cool, promoting the growth of ice crystals that make up the clouds. With the sun slowly emerging from a century-class minimum, the stage could be set for a good season of NLC watching. Typically, the first NLCs of spring are wan and pale, followed by better displays as summer unfolds. Browse the galleries from previous years to see what may be in the offing: 2009, 2008, 2007, 2006, 2005, 2004, 2003. On June 4, 2010 there were 1127 potentially hazardous asteroids.